Today is shamefully called National, or is it Global Endangered Species Day? This declaration of a special day like this, is disturbing on so many levels to me personally. It is not like Halloween, or Thanksgiving, with hype and hyperbole for a brief 24 hours. Those unfortunate animals on our planet that now suffer on the brink of being gone forever, do not need a national or global day, they need a year, a lifetime, an eon of attention to their desperate plight. Without drastic change, or a complete reversal in Global thinking, these creatures are surely doomed to become extinct and quite soon. There will be no links, or list of “places to learn more” today for this posting, as none are required. Every single one of us knows what is happening to animals everywhere, we have been told and warned about it for decades, we do not need to go read a Blog, a Newspaper, or even a Book. We Humans are more than likely, 99% of the cause of their decline, impending deaths and elimination from the Earth. We remain steadfastly, selfish, greedy and ignorant. Animals were not put on Earth for us to torture, abuse or murder. They were put here, I believe, to be our companions, our ……………., you fill in the blank. And we are responsible for assuring that they are allowed to live, survive, gasp, even thrive for as long as we are here. Not sure of the total accuracy of this, but do believe that our Florida Panther is the number one, most Endangered Mammal or Animal in America. Sadly, last week on our way up to Gainesville to see Breanna’s Vet at UF , we drove past what was my second sighting of one, both times they were lying on the side of the road, the apparent victim of a deadly vehicular accident. Is it any wonder that their numbers are now at less than 100? This magnificent animal, that at one time roamed not only all of Florida, but much of the Southeast, now finds itself relegated to a tiny area, not fit for a house cat, let alone a big cat, that requires a 25 square mile range to support them. We have, in this state, run our Panther, “our state mammal,” out of every single place that it used to call home. 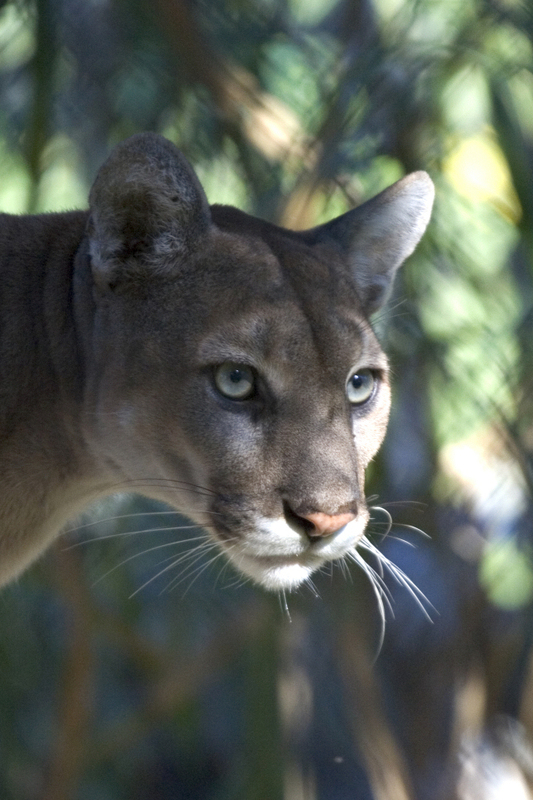 The words Ancestral Habitat and the Florida Panther are a joke, an oxymoron. They no longer know, where they came from, or where they belong any more. They are left, with what we greedy Humans have begrudgingly given them to survive on, and it is not even close to what they need, no MUST have to survive. Why have we taken away all of their land, you ask? To build another Strip or Shopping Mall, another Beachfront Condo, or to drill for more oil, gas, or other. It is all Pure Greed. Florida has enough houses, condos, malls and fossil fuels to last until the next millennium. Every generation comes with one who tries, nearly always in vain, to show us the error of our callous ways, in our treatment of our fellow animals, my most recent favorite is of course, Gandhi. His thinking, his comments, on the subject of caring for animals are legendary. Any man of his stature who would leave a gathering of dignitaries sitting, while he left to tend to his goats is my Hero. Gandhi had his priorities straight. Can the rest of us at least try to do the same? Personally, I will not celebrate in any way on this day of Endangered Species. No banner or sign waving, no protest marching, no screaming out for the world to celebrate this day. Instead, I choose on this day, to reflect on what I have failed to achieve in the year that this Blog has existed. a day of mourning for the animals who will likely not survive until it comes again next year. This entry was posted in Ancestral Habitat, Bears, Black Bears, Critically Endangered, Day of Animal Mourning, Endangered Animals, Endangered Species, Endangered Species Act, Florida, Florida Fish and Wildlife, Oil Drilling, Panther, Wildlife, Wildlife Issues and tagged Ancestral Habitat, Animal Issues, Animal Rights, Animal welfare, animals, Black Bears, Day of Animal Mourning, Endangered Species, Florida, Florida Fish and Wildlife Conservation Commission, Florida Panther, Wildlife Issues. Bookmark the permalink. Thank you Cher for your kind words of encouragement. Hope your millions of friends will do likewise for them! And God Bless you! I have some VERY serious animal lovers in my circle; we’ll keep doing what we can! Encourage them to connect to others too? Excellent! Thank you for your link!! Thank you so much for sharing this. I am grateful. Ur very welcome, and thank u.
I hear you clearly and agree completely. But please spend some time this day to reflect on the importance of your writing and the good you are doing. You educate, and that is a vital mission. And you love the natural world–love helps everything. What I do on this Blog matters little. Here is why I know this. on any one posting over the past year. I am not getting through to people, which means this Blog is not doing what it set out to do. You are very kind, but all that matters is what changes for animals. If they are to survive, things MUST change. Excellent posts such as this make us pause and think. If only they could also make us act! Thank you for this thoughtful post. You are so right too – much more awareness is needed if we are to save some of these struggling species from becoming merely history. How much damage we as a species have done in so short a time … it is something to mourn not celebrate. Your thoughts are so comforting. Writing this was difficult. I am sorry for making you cry. It was not my intention. This was one of the hardest things that I have ever had to write. I considered not doing it, but was hoping that some of you would want to know these things and so I did. Thank you for your warm wonderful heart. As we care for animals, man cares for the world. Superb post. Thank you for the support. It means a great deal to me, coming from you! Very well written. Although I don’t dwell on it, I periodically reflect that humans are animals and are also an endangered species. Removing any part of the eco-system is detrimental to the balance of nature. We will all be gone one day when our planet disintegrates but while we are here we have a responsibility to take care of it in its entirety. Sadly conserving our environment has become politicized and science has become vilified by by the party that self-identifies as conservatives. They have become the antithesis of the word conservative. They only thing they are concerned with conserving is their twisted ideology they want to force upon the world.